Chief Kevin Mooneyham, left, and Woodbury Mayor Harold Patrick. 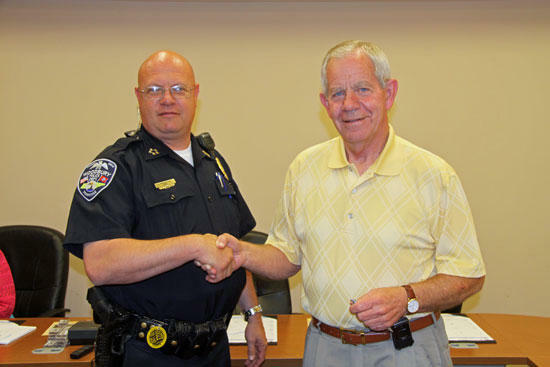 Kevin Mooneyham was named Woodbury Police Chief by a unanimous vote of the Woodbury Mayor and Aldermen Tuesday night. Mooneyham has served as interim chief since Tony Burnett resigned the position in February. His tenure as police chief will become official Friday, June 8. Mayor Harold Patrick, above right, congratulated Chief Mooneyham following Tuesday's vote. This is a good thing for the Town of Woodbury and Cannon Co. Congratulations Chief Mooneyham!! Well deserved.